Talking over old times . . .
Of the eight children born to Ole and Polly Oleson, the sisters Lillian and Olive may have been the most adventurous. Lillian, two years younger than Olive, was one of 69 students receiving a diploma from Lincoln High School in 1912. It is assumed Olive had also graduated from high school but it is not known if she attended Lincoln. Following graduation Olive and Lillian entered the nursing program at Good Samaritan Hospital in Portland, Oregon. Family history states that they graduated and became Registered Nurses in 1915. The following year the Medical School began plans to organize a Base Hospital to be transported to France as a support for the soldiers serving in WWI. Base Hospital No.46 was readying itself for overseas duty when Lillian applied for active service in February 1918. It is assumed that Olive also applied at this time. WWI was the first war to allow women to serve as members of the Army Nurse Corps. Of the some 1,000 local women who initially volunteered for service only 100, including the two sisters, were chosen. On March 26, 1918 a number of events were organized to honor the young women who would be leaving Portland for France. The day began with a communion service in the chapel of the hospital and included a luncheon at the Meier and Frank’s tearoom. On April 8, 1918 the nurses along with the other members of Base Hospital No.46 departed Portland on a train bound for the east coast. Some 500 Portlanders showed up to wave good-by to those leaving for France. In March Lillian was administered the oath of office as a member of the Army Nurse Corps. While we don’t have documentation of Olive having taken the oath to become an Army Nurse we do know from family interviews she traveled to France along with Lillian, sailing on the RMS Aquitania. The RMS Aquitania traveled the Atlantic with all lights out and camouflaged against submarine attack. Upon leaving Liverpool the ship was escorted to France by five destroyers. Upon landing at LeHavre, the hospital personnel then traveled through Paris ending up at Bazoilles-sur-Meuse near Argonne. The 100 nurses of Base Hospital No. 46 shared the voyage with some 6,000 troops. Perhaps to assure that appropriate behavior was maintained, dancing was not allowed. However the captain did allow other amusements such as singing, afternoon tea and listening to instrumental music. Lillian’s granddaughters remember hearing their grandmother saying that she and Olive were proud to do their patriotic duty. This reflected the general mood of the American public at this time. The sisters’ daily experiences would have been much like the reports we have from others serving during that time. Nurses were expected to work from sunup to sundown. Food was simple, sometimes scarce. Winifred Reinig, another nurse serving with Base Hospital No. 46, recalled a time when they had nothing to eat but hardtack and catsup. Base Hospitals received only severely injured soldiers. Being so close to the front, many of the casualties were the result of gas attacks. The nurses were required to wear gas masks to handle those who had been hit by chlorine gas. Methods to treat mustard gas burns had to be developed as neither the doctors nor the nurses had had experience treating these types of burns before this. In spite of the difficult conditions and the severity of the injuries the doctors and nurses of No.46 lost only 131 of the 8,366 patients served by the hospital between July 1918 and December 1918. The war ended in November of 1918 and the duty of the nurses then was to ready their charges for transport to other hospitals or to return to the United States. On April 4, 1919 Lillian and Olive left France and returned to the United States traveling on the Kaiserin Auguste Victoria. Lillian’s final paycheck as an Army Reserve Nurse, dated May 24, 1919, was $60 dollars and included a bonus of $178.20. After the War Lillian worked at a children’s hospital saving money to travel. In 1922 Lillian bought a 1922 Chevrolet and she and Olive along with another sister, Lovisa, drove it across the United States, stopping at one point at Glacier National Park. In 1930 and 1931 Lillian and one of her sisters set out on a world tour buying furniture in such places as Japan and Shanghai. The planned round-the-world trip took them to Canada, Japan, China, the Philippines, Singapore, Egypt, Italy, France and New York City. On January 18, 1931, Lillian married William Harris in The Church of the Transfiguration in New York City. A son, William S. Harris, was born to the couple on December16, 1931. It is not known how long or where Lillian may have practiced as a nurse. Research done by the WWI Research Institute, St. Helena High School, states that Lillian’s obituary indicates she had a fifty year career as a nurse and nurse instructor. We found no record of Olive continuing as a nurse but it is likely she did, as she never married. William Henry Harris died in 1975 and in 1978 Lillian married Kenneth Rhul. Lillian died in St. Helena, California in 1995 at the age of 102. Olive was the last of the Oleson children to live in the family home on Ames Way in Garden Home. Olive was 84 when she died. 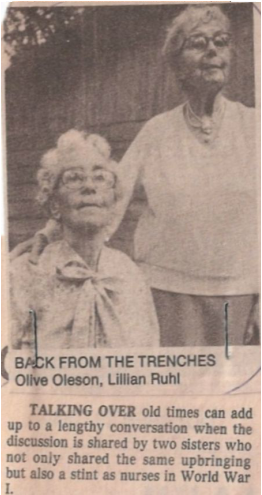 Lillian Oleson, WWI Research Institute, St. Helena High School. St. Helena, CA- material in part, provided by William Henry Harris, son of Lillian and William Harris. Thanks for your nice e-mail. Olive Oleson, my aunt, was born at the old house on Ames Way, originally a driveway to the house off Oleson Road. Her father was Ole Oleson, who immigrated from Karsruhl in central Sweden along with his father. They were farmers and immigrated in order to find good farming land. Their first stop was up the Mississippi river, next they looked at San Francisco, and decided to continue on. When they found Raleigh Hills, it looked just like the countryside in Sweden. He bought a homestead there and built the house, a close replica of a Swedish home. It actually was bought through the Sears catalog prior to the turn of the century. The house is now on the historic register. The family consisted of one boy, Alden Oleson, and seven girls. They all went to the school in Raleigh Hills, which (I was told) was named for the school teacher. Of the girls Lovisa, Olive, Lillian, and Thelma were all nurses. Polly, Edna, and May all married young and raised families. Edna and Polly (Ames) lived in homes built close to the family home. Part of the original family property was sold to Alpenrose dairy, another parcel was acquired by the county to straighten Oleson Road, and other parcels were sold off for homes. The original homestead included a stretch of Fanno creek, where the Oleson children fished for crawdads. Olive Oleson never married. The young man she was engaged to died in World War I, and even though she had several suitors she turned them all down. In her younger years she was quite a beautiful woman. I hope that this is of interest to you. I’m glad that you are interested in this bit of Oregon history. This entry was posted in Early History, Memoirs, People and tagged Oleson Family. Bookmark the permalink. There were two Oleson Girls that had their ashes placed out in their Garden. Olive and Vesua after their death. They were my great aunts. I think her name was Lovisa, she was the eldest of the Oleson girls.